(1) Will it be possible? What are the latest findings about the risk of a stop or reduction of the Gulf Stream? I hear different things each time climate scientists talk about this risk. Are there any indications that the Gulf Stream has lost some of its power? I mean this winter is extremely cold here in northern Europe... could it be the cause? I would not worry about a new ice age. Positive mode: Northern Europe warm, but Greenland cold. Negative mode: Greenland warm, but Northern Europe cold. This winter has so far been dominated by the negative mode, with temperatures in Greenland way above normal (+12 degress Celsius in Ammassalik a few days ago!) and Northern Europe having colder than normal conditions. If the Gulf Stream had slowed down then Greenland would be very, very cold as well - but Greenland is in fact very, very warm, because there is no significant change in the Gulf Stream - the warm air masses have just decided to go to Greenland instead of Northern Europe so far this winter. You can read more about the possibility of the Gulf Stream stopping here: http://en.wikipedia.org/wiki/Shutdown_of_thermohaline_circulation. I have done a little analysis of what we can expect... Below we see a graphic where the resent interglacial warm peaks have been shown to enable compare. Now, so far on this slightly small data foundation it appears, that speed of cooling after a warm period is slower after long warm periods, faster after short warm periods. Its as if the heat of a long warm period has affected the upper layers more. The heat is perhaps slightly deeper stored in the upperlayes after a long warming period, and therefore a long warm period is followed by a slower cooling when returning to ice age. If true, then a returning to ice age now will obviously affect us all, but perhaps the long wam period behind us will give us more time to adapt. There are many opinions on when the ice age will come, but i believe we are talking about a time limit of this to happen no larger than X thousdan years. That is, there are many opinions on when an ice age will start, but an ice age will come within thousands of years. For compare we have the other serious threat of a meteor impact of the worst kinds. These happens with millions of years in between. But even though we know that meteor disasters are perhaps 1000 times less likely than an ice age to occur soon, we spend quite a dollar on preventing meteor impact rather than making systematically preparations for ice age. This is a problem. its a problem that we dont play it safe because of a global warming debate that silences the thread of an ice age. (8) According to the theory of orbital forcing or Milankovitch cycles, the next ice should be held off for something like another 40,000 years. The prominent cycle maintaining the current mild Holocene period interglacial is that of the Earth's orbital eccentricity which is slated to favor warmth for several 10's of thousands of years. 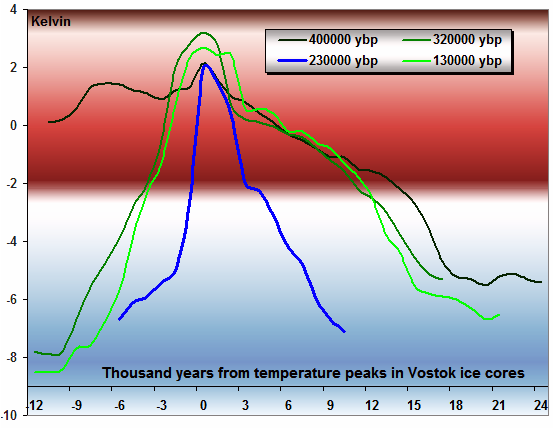 No ice age anytime soon due to the same factors which have produced the past 3 million years of ice ages. AGW will play out on the century scale and is thus of far more immediate concern than any ice age potential. (33) The next ice age is about 12,000 years from now. Don't worry about it: global warming is a vastly more pressing problem. (11) When you talk about gulf stream reversal, its not an ice age. What you're talking about is how the heat pumps moving heat around the world will change. I guarantee that the result won't be what you expect. Namely, we're still heating the place, so, a golf stream reversal would mean that the heat would be blocked, or move in a different (currently unknown) fashion. Given that the arctic is heating up at a horrendous rate, that would at the very least imply a very mild 'ice age' (if we can call it that). (3) other serious threat of a meteor impact of the worst kinds. These happens with millions of years in between. The shared detailed information is very useful. Explanation for Climate change can be found in classical physics, from Newton's Universal Law of Gravitation. Climate Change occurs as a result of shift in center of mass of the earth and change in axial tilt of the earth. Center of mass of the earth can change due to many reasons like an earthquake, a volcanic eruption or due to many human activities. This changes the axial tilt (obliquity) of the earth, shifting the axis of rotation of the earth, changing the orientation of various regions of the earth's surface with respect to the sun, directly impacting climate change. These changes due to natural phenomena and human activity are almost unpredictable and hence the resulting climate changes too, become almost unpredictable. The human activities, which may result in shift of the center of mass of the earth and change in its axial tilt, directly affecting climate change are listed below. Among many reasons, the main factor influencing the shift in center of mass of the earth is uncontrolled extraction of fossil fuels from the earth's crust. Apart from its direct impact, the continuous and uncontrolled extraction of fossil fuels disturbs the structural stability of the earth's crust. This includes disturbing the stability of tectonic plates and their movements, resulting in increased number of earth quakes and volcanic eruptions etc., resulting in further shift in center of mass and axial tilt. The possible implications are completely unpredictable because we have limited understanding and influence over the dynamics of the earth's crust and hence the unpredictable change in climate. As the massive extraction of fossil fuels increases rapidly, especially in the last 2 decades, climate change too, is becoming more intense and unpredictable. (23) The Gulf stream is doing just fine, as for ice-ages, well interglacials (the warm periods inbetween) typically last 10 to 12 thousands yrs, well the last ice age was 12.000 yrs ago so we could be due forone now, but dont worry they start very slowly and it is a long time before they get seriously cold. The link below is to my entirely fictional story in the form of a screenplay. But it would seem to raise some questions about past and future ice ages. It's old. I wrote the first draft in 1985. But it still seems entertaining and relevant. I had more questions, though. So I pecked off this nonfiction account on my keyboard. It is more than a bit hairy. But in this winter of Boston being buried in record snow it might prompt a piercing question or create a line of interest. (44) Seriously, is the next global Ice age possible within our grand children's lifetime? Is there any way that we humans can accelerate it? (6) I guess that I felt the same way. I experienced a new ice age vicariously by (1.) writing about it, and (2.) by having that episode doubly vicarious by having my news reporter character experience it through a brain transplant of material derived from a frozen Neanderthal brain. That way I avoided feeling the severe cold of an ice age. I guess that I felt the same way. I experienced a new ice age vicariously by (1.) writing about it, and (2.) by having that episode doubly vicarious by having my news reporter character experience it through a brain transplant of material derived from a frozen Neanderthal brain. That way I avoided feeling the severe cold of an ice age. lol, but yours is more of a novel way of inducing it coz' you wrote a creative/fiction story about it. I had fun writing the story. And your allusion to a "novel" is partly correct. My screenplay "Sinking Into Summer's Arms" is also a novel, one of several of my science fiction novels published by POD publisher iUniverse.com. They cost to buy. But also free on the same Scribd site as my two above links is my novel modernizing Mary Shelley's little know novel "The Last Man." I retitled it "The Last Human." You can Google that title, and my name, and Scribd and find it and read it. It has become terribly timely with the recent Ebola scarre and the establishment of the Islamic State in Iraq. ...yeah...novel, but by that i mean something new, different or unique. I may have to find some time reading some your works (they are good reads). By the way guys if you have time try to check out this new collaborative website that I chanced upon: erissolver.com. I found this unique to in that users can contribute to a collective intelligence by tackling today's common problems such as climate change and global warming. Its more interactive and unique than our usual forum and discussion type format. Yes, that's my theory of novels, too. You may notice (if you read it) that in my novel "The Last Human" I have the chapters go backward and call them "Countdown" rather than "Chapter." Mary Shelley probably would have liked that. Getting back to a potential coming ice age, the record snow in Boston may well be a freak. But it follows another freak just like it, only not quite so big a record. This should set off alarm bells, even if the panic may be misplaced. Something could very well be going on. Circa 12,000 years ago, in this exact spot where I am typing to you, there were two KM of solid ice above me. It probably started with an extra heavy snowfall, possibly aided by a large volcanic event. All that snow in Boston these last few days could be an extra-early warning. Or, of course, maybe not. That's the whole trouble with this. Easy for me to do. There are actually geological "moraines" left over from 3 different ice ages just south of here. As school children we were taken to see these on science field trips. So all of us living here are very aware of the coming and going of ice ages. The clear evidence of these repeated ice ages inspired both my fiction story/screenplay "Sinking Into Summer's Arms," and my nonfiction piece "An Ice Age From Global Warming." The most recent of these "moraines" (that run completely across the width of the State of Ohio) indicates that the Great Continental Ice Sheet that covered much of North America began retreating somewhere around 11,000 to 12,000 years ago. Its ice, and the ice of the two previous continental ice sheets, is estimated to have been about 2 to 3 km thick. oh i see...now you have justified it. Probably, its fascinating to live in your place. You have such inspirations f0r your writing w0rks. The outside temperature is circa minus 5 C as I write this to you. The typical winters here helped to inspire my stories. The end moraines of the great ice sheets from those 3 different ice ages are on average only 50 miles (80 km) apart as they cut across Ohio like giant snakes. That suggests that the ice ages formed and then melted away within tight energy/temperature restrictions. (14) So, pardon for asking, but what caused the first ice-age? Are we still so sure about this? KeiranK wrote: So, pardon for asking, but what caused the first ice-age? A certain prevalence of ice.